Whatever recolours you already have of both the counter and those paintings will work to provide you with endless possibilities. 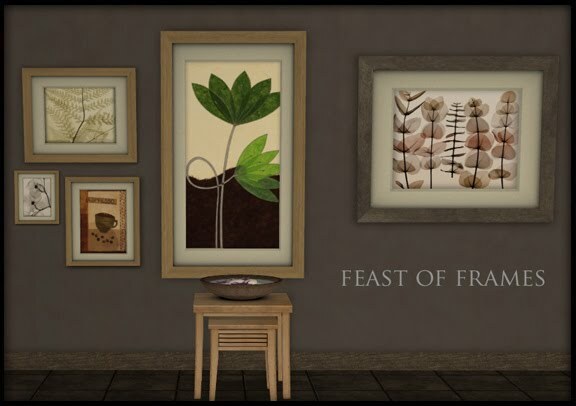 Nothing overrides any in-game or custom content and you do not need BV for the travel poster based frames to work (please see special note under download). All meshes are modified Maxis. A collection file is included. 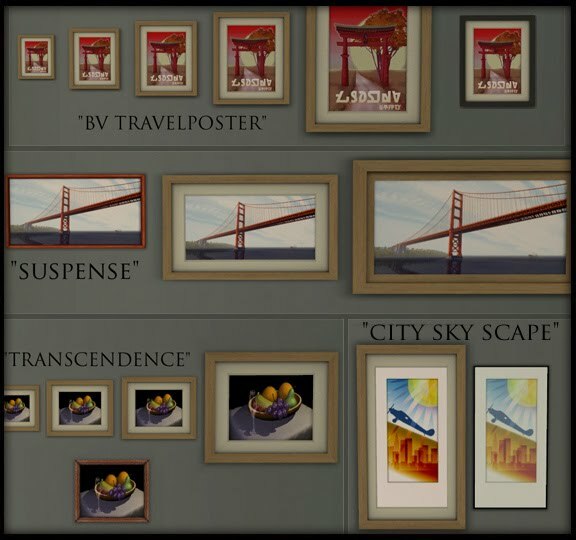 Since Mediafire won't let me go over 2MB here are the Maxis recolours I made to test the frames: 17 for the BV travel poster, 8 for the OlivePeynterCityScape, 6 for Suspense and 4 for Transcendence and I may as well share. Delete what you don't like in game. All art by the respective artists. I'll add a piccy later to show what you're getting. **Note for those without BV. You will notice that in your menu the frames that are linked to the BV travel poster will be blue inside. This is normal since the objects are referencing something you do not have. You MUST have at least one recolour for the frames to take on the paintings. You can recolour either before placing or in game. And yes, you can now download and use any BV poster recolours you find. You could also try the base game version by Huge Lunatic to remedy the blues:). eefje00704 for the Bv suggestion even though I just wanted to do base game paintings. HugeLunatic for the base game version that I used to extract the mesh, texture and much needed references for my frames to work. 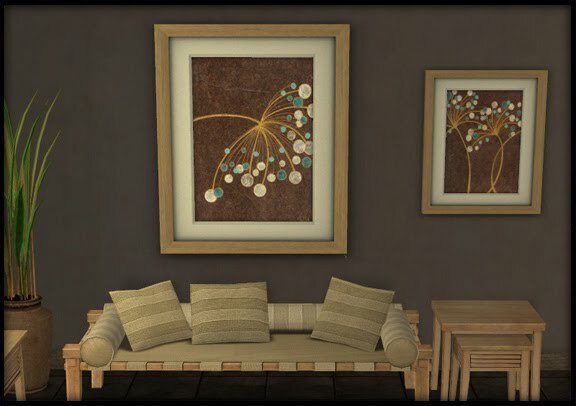 lmhwjs from Clutter-a-holic whose beautiful recolours I used when first testing the idea and are shown in the far corner of screenie 3. MogHughson for the MTS tutorial: Custom Cameras For Thumbnails. The people who tested to make sure all was well. I'll admit that this started off as an easy and quick project but ended up a bit more complicated and time consuming. How perfect is this, thank you muchly for sharing your talent!! You! You really are a wonderful personage =) This is great and I thank you for sharing with us Buggybooz groupies! Now you have seriously made me download the entire set. Lovely work Buggybooz. Thank you so much Buggybooz, these are amazing! I love Kitchen Basic and this makes it even more versatile. Oh, and for people without BV HugeLunatic extracted the travel poster and made it base game compatible http://sims2artists.sublimesims.net/smf/index.php?topic=1705.0 You can link to it in your post so everyone can use it too! these are GREAT - thank you so much!! this is such a clever idea! Love it! As usual... great job, thanks! I don't have BV but it works for me. I have many recolors of it. Should I run it by HugeLunatic though? These are great!! Thank you soo much!! dhearest, I did already but if its working for you then that's good news. Really a nice post. Thank you so much. This is great job..
Hi there. I'm sorry to bog your comments down with silly questions, but I could not find another way to p.m you. I reeeally want to recolor the paintings and use your frame, but I cannot figure out how to do so. I am very new to recoloring, so I apologize for my ignorance. When I want to recolor just the painting, should I recolor the "Buggybooz Poster Recolors" > then either the "BB Basegame" and/or "BB TravelPoster" RCs? I know this is probably a very stupid and simple question and I apologize, but I would very much like your help. Thank you so much. These, like all your creations, are gorgeous!! kapja17 You can send me a pm at BPS and I will reply. 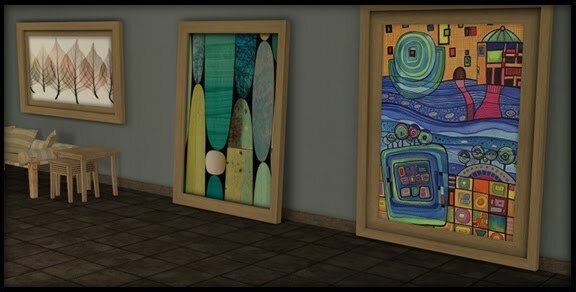 All the paintings here are recolours of in game ones so I guess in SimPe you open object workshop and find the EA painting you want to recolour BV travel poster, suspense, transcendence etc. There are good tutorials at MTS for how to recolour paintings and I would start there. Unknown, why wouldn't you be allowed to recolour an in game item??? Confuzzled by your wierd question. I love this frame set! Love your work! I'm planning on using a lot of it in a lot that will be featured in a story of Prudence and Simon Crumplebottom. I love your work!! And I was so happy to see, that you created collection files!! Thank you so much!! I can't get these to work, correctly. I have all EPs and SPs except for M&G, I downloaded the packages and the recolors, but when I go into the game, the frames are flashing blue. What did I do wrong? I have always loved your work and so appreciate your sharing your creations with us. I want these awesome frames as well, but when I click the links, I get an ad for Mediafire Pro, and not a download link. Can you help? I am sorry to be a bother! Thank you again for all you have added to my game. For the first question it does actually say here that the frames takes their texture from the Kitchenbasic counter and the in-game description says something like "you must have the Kitchenbasic counter for this to work in game" so I can't really be more specific than that. Second question, yes I have seen this and I am now in a position to do something about it. I will be changing the set up of the links as soon as I can so please be patient.